"...The young performers in Brown's cast cut through those unseen walls, of course, and they're all terrific, especially Bre Jacobs, a big talent. You'll be intrigued by the voice of Micheal Lovette, who plays both a bus and a dryer and makes them live. Robertson dives hard into Rose, the well-meaning white woman who just makes everything worse, and, better yet, she's unafraid of her character's dysfunctional understanding of her own power. Some of the smaller Gellman roles feel overplayed, which is too easy a choice, but there is warmth to Schwart, although I never felt close enough to see into his eyes." "...A background plot in the masterful Tony Kushner-Jeanine Tesori musical "Caroline, or Change" - receiving an intimate, stirring production by Firebrand Theatre in partnership with TimeLine Theatre - involves the secret removal of a Confederate statue. In prior productions, such as the sterling Court Theatre mounting with E. Faye Butler as Caroline in 2008, this seemed mostly just one more historical reference in a story, set in 1963 Louisiana, filled with them. But given contemporary political events, this narrative component jumps out now." 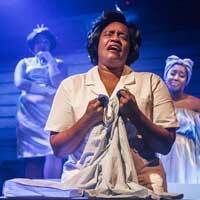 "...Caroline, or Change, with music by Jeanine Tesori and book by Tony Kushner, revels in tension, juxtaposing racial inequality with domestic unhappiness. Firebrand's production, directed by Lili-Anne Brown, is graced all-around with fearless, fantastic singers. Bre Jacobs turns in an especially strong performance as Caroline's eldest daughter, Emmie, who has all the impetuousness and petulance of a young girl eager for the change her mother has spent her life accepting can't and won't happen." "...In the hands of a superb cast and a knockout offstage band (led by Andra Velis Simon), Tesori's elastic, multi-hyphenate score leaps from playful to profound to haunting to hilarious with an abandon matched only by its precision. Three performers must be singled out in addition to those already mentioned: Bre Jacobs, a young actor to watch, as Caroline's strong-willed and free-spirited daughter, Emmie; Michael Kingston as Rose's bombastically Marxist, thank-God-he-didn't-have-Twitter father; and Nicole Michelle Haskins in a brash, vibrant turn as as Dottie, Caroline's fellow maid and sort-of friend." "...For the first production of their sophomore season, Firebrand Theatre has partnered with TimeLine Theatre Company to present the musical �Caroline, or Change.� With music by Jeanine Tesori (�Fun Home� and �Violet�) and a book and lyrics by Tony Kushner this through-composed musical spans the final two months of 1963 and is set in Lake Charles, Louisiana. The entire cast, under the direction of the very busy and in-demand Lili-Anne Brown, deliver a very solid and moving show." "...Under Firebrand artistic director Harmony France and director Lili-Anne Brown, this �Caroline, or Change� is an exceptionally skillful, seamless, and enjoyable production of a work by two theatrical giants, Jeanine Tesori and Tony Kushner. Beyond skillful, the work of this team is deeply felt and empathetic, all of its technique and heart coming together to tell a story that is elusive, particularly in musical theater." "...Tesori�s score is a radiant, often blistering blend of soulful anthems, bluesy self-discovery songs, playful imaginary riffs, impassioned conversations between women waiting for a bus, between mother and daughter, between a woman and her God, and more." "...Every so often there comes along a special show that informs audiences that here is a new theatre company that should be taken seriously. It began last year, with Firebrand�s eye-popping, jaw-dropping premiere production of �Lizzie.� Now, continuing into their second season, this company is showing Chicago that their first production wasn�t just a fluke. With this unique, exciting, inspirational musical, partnered with TimeLine Theatre, gorgeously directed with confidence by Lili-Anne Brown, and supported by a terrific cast and artistic team, �Caroline, or Change� is one of the Fall Theatre season�s must-see musicals." "...CAROLINE, OR CHANGE has it all: writing, directing, acting, singing, dancing, drama, comedy, reality, fantasy. It is sensational! The only thing I would change is the theatre�s acoustics. In many songs sung by multiple performers, the words were hard to understand. And on opening night, sweet young Sims� microphone wasn�t working correctly. Still, this show is thought-provoking and up-lifting. I highly recommend making plans or changing plans and seeing this production." "...Above all, Caroline or Change is a story of strong women fighting for the right to thrive, not just survive. It's in line with Firebrand Theatre's mission. As the world's first feminist equity musical theatre company, Firebrand is committed to producing shows featuring strong women, produced and designed by strong women behind the scenes." "...If you are unfamiliar with this play I suggest you definitely put it on your "must see" list. And I will venture to say, that you are not going to get a much better chance than this Firebrand Theatre presentation of "Caroline, or Change."" "...It isn't often that you see a musical in which the main character scowls for pretty much the whole show, but in Caroline, or Change, the title character has plenty to scowl about. Played by Rashada Dawan in a transcendent performance, Caroline is a divorced maid in 1963 Lake Charles, LA, trying to feed a family of four kids on her meager $30/week after breaking off her relationship with an abusive husband. Her best friend is trying to move on from the service life by taking college classes at night, but Caroline is stuck in a dead-end job with only daydreams of a relationship with Nat King Cole to sustain her." "...Change for Caroline Thibodeaux isn�t easy, but change is coming. The wage she earns for the long hours doing laundry barely allows her to put food on the table for her three kids at home. She spends her days working underground between the washer, the dryer and the radio, and her nights in the shadow of the moon, dreaming of a better place. A fearless, central performance by Rashada Dawan makes Firebrand Theatre�s pulsating new production of the Tony Kushner/Jeanine Tesori musical �Caroline, or Change� a stunning work of art!" "...This is one of those musicals that feels more like an opera (score by Jeanine Tesori) and where you find yourself almost gasping at the brilliant performances one after another. On opening night there was in fact an audible "aww..." when adorable Lyric K. Sims who plays Caroline's youngest child comes on stage. She and her two sibling characters-Emmie played by Bre Jacobs and Jackie played by Princess Isis Z. Lang- sing and dance with style, and especially with Medina in "Roosevelt Petrucius Coleslaw", a song which serves as somewhat of a pressure relief valve on the play's mounting tensions."